For 2016, celebrate the 30th anniversary of this popular silver coin! 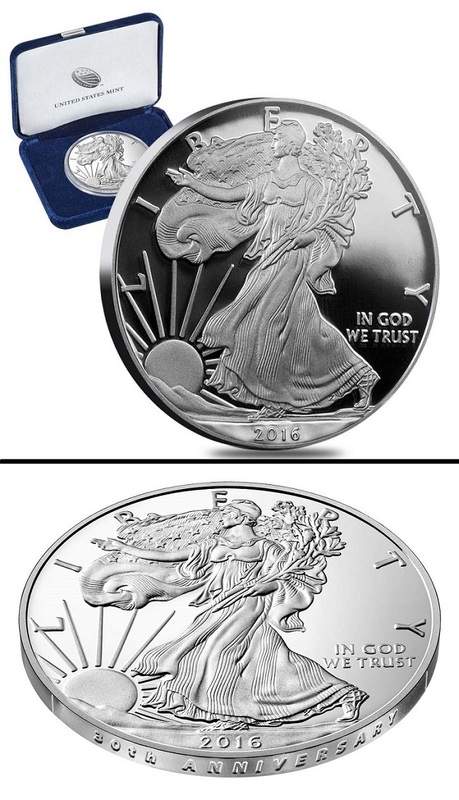 The 2016 proof silver eagle is minted at West Point, New York and includes the original mint packaging, velvet presentation case and Certificate of Authenticity. The coin features the prized "W" mintmark on the reverse. The obverse design features Adolph A. Weinman's stunning Walking Liberty design dating back to 1916, with an ever hopeful Liberty striding confidently toward the sunrise, draped in the strength of the Stars and Stripes carrying in her arms branches of laurel and oak to symbolize both civil and military glory. The reverse design, by United States Mint sculptor John Mercanti, features a striking heraldic eagle with shield, and olive branch in the right talon and arrows in the left. To celebrate the 30th anniversary of this coin, the words "30th ANNIVERSARY" are incused onto the smooth edge of the coin. All previous silver eagle dates had reeded edges and this is the first silver eagle ever to feature a smooth edge with lettering.